http://www.biotaresearch.com/project_fisheries.html - Biota Research and Consulting, Inc.
Biota was hired as prime contractor to complete geomorphic assessment, design, permitting, construction implementation, and post-project monitoring during this multidisciplinary project that improved fisheries and ecological values on an active agricultural property. Biota worked closely with the Teton Science Schools (landowner) and the Indian Springs Ranch home owner association to develop and implement a project that achieved multidisciplinary benefit. A total of 1.2 miles of Spring Creek and 1.4 miles of Cody Creek were restored through construction of a stable channel form designed using a Natural Channel Design approach. In addition, 4 existing diversions were rebuilt to improve irrigation operations and benefit fisheries components, off-channel livestock water facilities with solar pump sources were installed, fish screen were installed on existing diversions, and 1,000 dormant woody (willow and cottonwood) plantings were installed to improve riparian conditions. Post-project monitoring during the first year documented 61 pair of Snake River fine-spotted cutthroat trout spawning within the project area. Biota was hired by Trout Unlimited (the Snake River Headwaters Project Manager and the Jackson Hole Chapter) and the Trust For Public Lands to conduct this ongoing watershed restoration project. The project objectives are to restore system impairment in four tributaries to the Upper Gros Ventre River that were historically impacted more than 110 years ago during homesteading of the area. 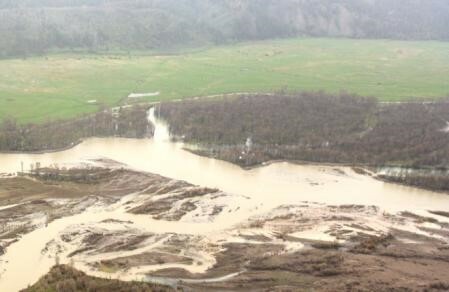 Remnant stream impacts include obliteration of historic channels, disconnection between tributaries and the Gros Ventre River mainstem, persistence of irrigation ditches that capture stream and spring flows, and morphologic and structural barriers to fish passage. Biota's ongoing work on this project includes site assessment, geomorphic and topographic survey, hydrologic and hydraulic analyses, and development of system restoration alternatives to maximize fisheries and fluvial conditions in this remote ecosystem. 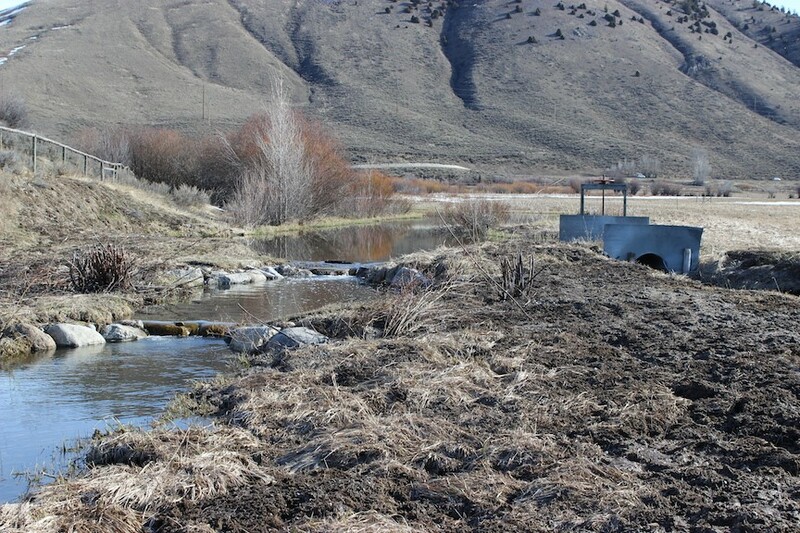 Biota was hired as project lead to complete channel assessment, design, permitting, construction supervision, and post-project monitoring during this large scale restoration project in eastern Idaho. Project activities include restoration of a 3-mile reach of entrenched and degraded stream in the headwaters of the Blackfoot River basin. Project objectives include habitat enhancement for all age-classes of native Yellowstone cutthroat trout. Biota staff applied an Natural Channel Design approach to complete hydrologic and geomorphic assessment of the entire project reach, and analysis results were utilized to develop a comprehensive fluvial restoration plan in 2013. Phase 1 of construction was completed in the fall of 2013, and the remainder of the project was constructed under Biota’s supervision in the fall of 2014. Stable channel morphology and aquatic habitat improvements were designed based on hydrologic regime, geomorphic condition, sediment conditions, and site attributes. Project treatments include reconstruction of stable channel morphology; restoration of floodplain connectivity; bank stabilization; channel elevation and grade control structures; restoration of pool-riffle sequences; revegetation and re-establishment of woody vegetation; improvement of fish passage through culvert modification; riparian exclosure fencing (to exclude approximately 20 acres); and construction of 6 off-channel livestock water facilities. This regional demonstration project was funded by a diverse partnership of state, private, non-profit, and private sector stakeholders. Biota was hired by the local chapter of Trout Unlimited and the Wyoming Game and Fish Department to restore stable channel morphology to improve habitat for native Snake River fine-spotted cutthroat trout in Flat Creek on the USFWS National Elk Refuge. Hydrologic investigations and geomorphic assessment were completed to investigate current fluvial conditions and system impairments. A channel restoration and fish habitat enhancement design was specified to achieve appropriate channel morphology based on local hydrologic regime and sediment inputs. Previously installed treatments were removed and stable channel morphology was constructed in order to achieve aquatic habitat enhancement objectives. The design included some instream structures, but emphasis was placed on reconstructing channel dimensions using vegetative treatments (sod mat layering, gravel placement, woody member installation) and establishing design profile and bed features through placement of appropriately sized substrate. Phase 1 of the project was implemented in 2013 and post-project monitoring conducted by the Wyoming Game and Fish Department documented increased fish utilization and spawning activities of wild Snake River cutthroat trout. Phase 2 of the project was implemented in the fall of 2015, and the final phase (3) of the project is scheduled for implementation in 2016. This high profile project was funded by a collaborative group the included Trout Unlimited, Wyoming Game and Fish Department, Snake River Fund, National Fish and Wildlife Foundation, Teton Conservation District, Rocky Mountain Elk Foundation, Wyoming Wildlife and Natural Resource Trust, and private donors. Biota was hired by the Teton County Road and Levee Department and the Teton County Engineering Department to design, permit, and implement solutions to severe lateral channel migration, bank erosion, and flooding along the Snake River south of Jackson, Wyoming. Geomorphic assessment and related analyses were used to develop a design that incorporated various instream structures to stabilize stream banks and protect private lands while addressing concerns of localized flooding and threats to public health, safety, welfare, and county road infrastructure. The effort achieved project objectives of bank stabilization and flood control along a reach of the flashy Snake River where peak flows have reached 30,000 cubic feet per second (cfs). Biota was initially hired to conduct a geomorphic assessment of an anthropogenically altered 2-mile reach of Teton Creek, and to assess the validity and appropriateness of an existing restoration plan. Biota completed a comprehensive geomorphic analysis of existing and proposed channel conditions, which revealed inadequacies in the existing design associated with sediment transport and fluvial function. Based upon our findings, Biota was hired to compile an appropriate final project design that was implemented during a $2.6 million restoration effort of more than 1 mile of the creek located in Driggs, Idaho. The project involved reconstruction of stable channel morphology; achievement of sediment transport discontinuity; riffle-pool sequence construction; restoration of channel planform and profile; construction of specific channel geometry based upon sub-reach slope; reconstruction of inset floodplain; and revegetation/woody vegetation establishment measures. Biota developed the final restoration design in 2013 and the project was constructed in the fall/early winter of 2013. The project received support and funding from diverse and collaborative interests including Western Native Trout Initiative, Idaho Department of Environmental Quality, Idaho Department of Water Resources, National Fish and Wildlife Foundation, Jackson Hole One Fly Foundation, Idaho Department of Fish and Game, Natural Resources Conservation Services, Teton County, City of Driggs, and FEMA. Biota was hired to complete site assessment, restoration design, permitting, and construction supervision of this stream restoration project in upper Fish Creek. The project design was completed using Natural Channel Design methods in order to identify functional channel dimension, pattern, and profile. The project accounted for anthropogenic alteration of local hydrologic regime, sediment inputs, and land use constraints on an active agricultural property. Project completion resulted in maximized fisheries and ecological values while complimenting on-site ranching and farming activities. Biota worked for the Teton County Idaho Engineering Department to design stabilization activities within and adjacent to Badger Creek to control flood waters, halt severe erosion, prevent loss of public infrastructure and private lands, and comply with regulatory requirements. Based upon hydrologic analysis, geomorphic assessment, and sediment transport modeling and hydraulic condition assessment, a stable channel morphology was designed and constructed through channel grading and incorporation of various hard and soft treatments. The project was implemented in 2012, and has functioned well to demonstrate that county infrastructure can benefit from appropriate fluvial system improvement efforts. 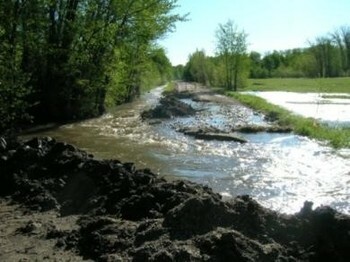 The effort restored proper fluvial process, protected public infrastructure and safety, and rectified flood conditions that have destroyed Teton County roadways numerous times in the recent past. Biota completed geomorphic assessment and compiled a comprehensive restoration design for a 7-mile reach of the Portneuf River located just downstream of Lava in southeastern Idaho. The project was completed for Trout Unlimited and the Portneuf River Partners, a collaborative group comprised of agency personnel, conservation groups, landowners, and interest groups. Biota applied a quantitative approach to riverine assessment that included hydrologic modeling; geomorphic assessment; channel surveys; substrate sampling; hydraulic analysis; sediment transport modeling; and development of conceptual restoration design treatments for the entire project reach in order to restore and enhance the anthropogenically altered watercourse. Biota completed site assessment, design, permitting, and implementation of this project. The project focus was to restore fish passage, improve the ecological values of the area, and sustain ongoing agricultural operations. The persistence of an established earthen dam across the river channel maintained a barrier to fish passage, resulted in severe local sedimentation, seasonal increases in water temperature, and severe fluctuations in dissolved oxygen levels. Biota designed and implemented a system solution that included dam removal, construction of a quarter mile of stable functional river channel, and relocation of the two diversions to an upstream reach in order to increase hydraulic head at the ditch inlets and accommodate agricultural operation requirements. The project resulted in restored fishery access to a nearly 3-mile reach of river habitat, while accommodating the needs of the local agricultural operation.